Halloween is quickly approaching! This free printable Halloween Word Scramble is a fun game for your kids to play while they are waiting for the BIG day! It’s also a great addition to some special Halloween goodie bags for your child’s friends and classmates. How many of these can you guess correctly? Let us know in the comments below. What words come to mind when you think of Halloween? Have they made it onto this list? Click here for the free printable. The answers are on the bottom of the free printable. 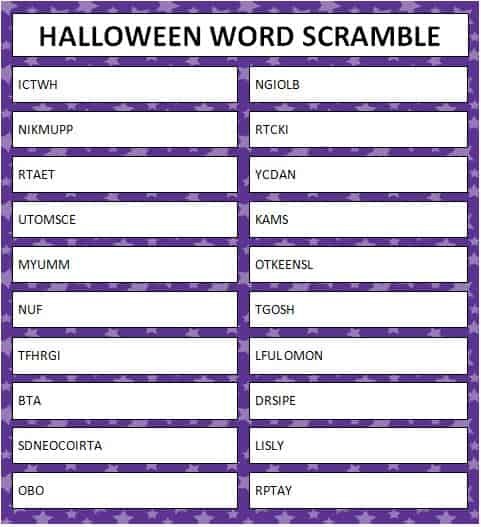 You may want to fold this over so your kids can’t see the answers until they have completed the Halloween word scramble. The answers are: Witch, Goblin, Trick, Treat, Candy, Costume, Mask, Mummy, Skeleton, Fun, Ghost, Fright, Full Moon, Bat, Spider, Decorations, Silly, Boo and Party. 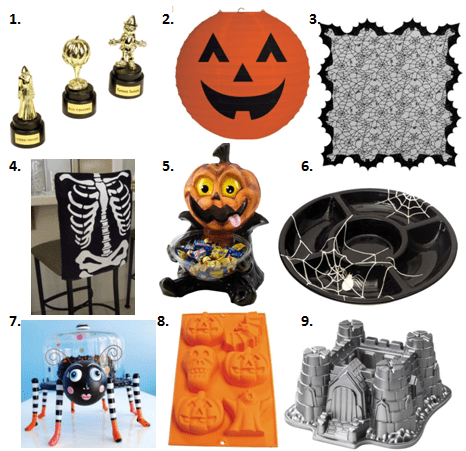 For more fun ideas for the holidays including party ideas, free printable games, activity ideas and more – visit our special Holiday Fun page and scroll down to the section for Halloween in October. What is your favorite thing about Halloween? The cute costumes? The delicious candy? The spooky parties? I love seeing my little guy in his costume every year. He’s such a little cutie! We’re always adding more family fun ideas – for all the special holidays and just for every day fun – and we’d love to have you join our communities to stay updated in the latest ideas and freebies. You can follow along on Facebook (where we post our new ideas first), Pinterest (our community’s favorite way to store ideas for later) and Twitter. We also love requests from readers so if there are any activities you need help planning, be sure to let us know and we’ll help you brainstorm some fun ideas.